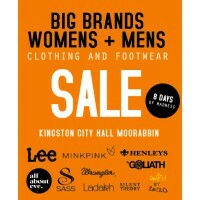 8 days only, big brands clothing + footwear sale. 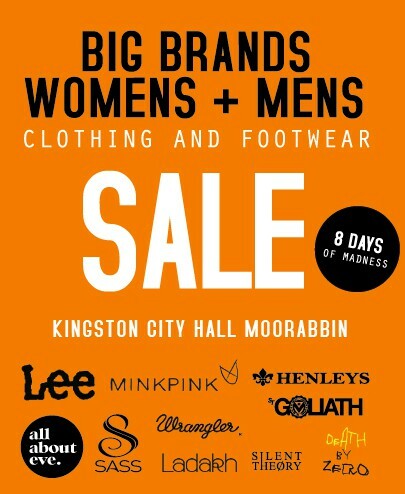 The Kingston City Hall in Moorabbin is jam packed with the BIGGEST mens & womens clothing and footwear brands for a HUGE 8 day sale! This is a crazy opportunity to pick up a bargain from some of the hottest labels around. Brands include Deacon, Mink Pink, Ladakh, All About Eve, Sass, Lee, Death By Zero, Silent Theory, Henleys, Wrangler, St Goliath, Jorge and many more.